Things may be going great for you. You have the perfect life. A family who loves you. A career that is going places. You have never had any contact with law enforcement, ever, for any reason. Then, one night after going out to dinner with your spouse, you are stopped by police. They ask you to do the field sobriety tests, and in an effort to be helpful, you agree. Before you know it, you are in the back of the police car, arrested for drunk driving. It is normal to be scared in this situation. You have no idea what to expect or what to do to make sure that this does not ruin your life. The first thing that you should do after your arrest is to insist that you have an experienced criminal defense attorney by your side before you talk about your case. 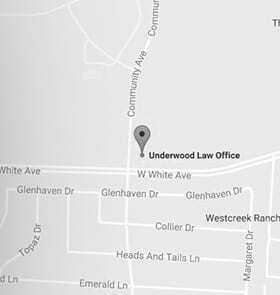 At the Underwood Law Offices, with locations in McKinney, Texas, and Huntington, West Virginia, our lawyers are on your side. We will help you understand the charges you are facing, and take action to present a strong defense that helps you protect your license. You have options in your drunk driving case, but it is up to you to take advantage of them. Pleading guilty without talking to an attorney may make things more difficult for you in the long run. Whether this is your first offense, or you have repeat convictions on your record, our attorneys are here to help you. We take our responsibilities to you seriously, because we know you are counting on us to make things better. If you want to learn more about how an experienced DWI Attorney can help with your DWI case, please call our toll-free number 844.UNDERWOOD (844.863.3796) or send us an email for a free consultation. Se habla español.